There are many career paths open to the person who is trained in HVAC. Moreover, the job requirements for an HVAC technician will likely vary depending on geographical location, type of employer and experience. Even so, this article seeks to give a glimpse into a typical day in the life of an HVAC technician. If you are considering studying HVAC but are not sure if it is the right career choice for you, consider the following to determine if you may be ready to seek vocational training in the field of HVAC. The work schedule of an HVAC technician may vary due to their form of employment. If you work for a company that handles HVAC repair, your day may start at any time. Temperature control systems can break down at any given moment and they need to be repaired in a timely manner to protect people’s comfort, health and safety. On the other hand, those who work for a construction or home building company that only installs air conditioning units will probably have a rather stable schedule and start work during regular business hours. HVAC technicians typically start their day by going to their workplace and learning about the tasks they are expected to perform. Self-employed contractors may be contacted directly by their clients and fulfill those duties as they see fit. Some appointments may be easy and quick to take care of while others may take a long time to complete. After determining which clients have to be served that day, the HVAC technician will gather the HVAC tools and safety gear required, and head to the location where they are needed. The number of appointments per day will depend on the nature of the tasks at hand. For instance, you may be called to a business location to install and set up an HVAC unit. Such a job is likely to take the better part of the day and you will need to work with a number of colleagues to get the job done right. On the other hand, you may have a number of small, short jobs such as fixing an HVAC system in a home or performing a regular maintenance check on a refrigeration unit in a small business. While HVAC technicians mostly work indoors, they sometimes also handle outdoor equipment, sometimes under strenuous weather conditions. They also often work in uncomfortable or confined spaces. In some instances, even if the HVAC technician has a set list of tasks scheduled for a specific day, they may be given additional jobs throughout if they work for a company that handles emergency HVAC repair. While it can certainly be exhausting to take on additional work, the good news is that many HVAC technicians can earn a lot of money by agreeing to work overtime. Furthermore, those who obtained an HVAC certification and decided to start their own business may also have administrative responsibilities. As you can see, an HVAC technician leads a busy life. As an HVAC technician, you would likely be on call at times and expected to have the stamina to handle a full, diverse schedule. The work can be demanding and sometimes dangerous. Good communication skills are also a must, as you would be interacting with many different people from all walks of life. However, if you decide that working in this field is right for you, you are certain to find it fulfilling, interesting and even quite lucrative. 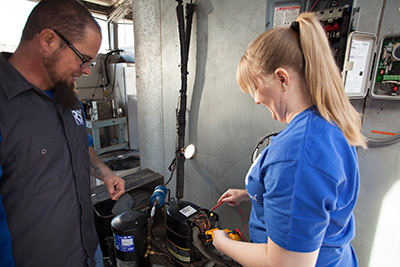 If you’re ready to investigate how HVAC training may positively influence your life and career path, don’t hesitate to contact a friendly representative at RSI for more information.